Turkey’s recent economic problems had little effect on the election results, wrote Bulent Aliriza, director of the Washington-based Turkey Project at the Center for Strategic and International Studies (CSIS). The economy was widely perceived as being Turkish President Recep Tayyip Erdoğan’s Achilles heel in presidential and parliamentary elections held on Sunday. In the weeks leading up to the vote, major economic indicators, like the exchange rate and inflation, showed significant deterioration, with Turkey’s central bank raising interest rates three times during the election campaign in an effort to shore up a collapsing currency. The result, in which Erdoğan retained his presidency by winning more than 50 percent of the vote, also vindicated the decision to hold elections 17 months early to mitigate the negative effects of an economy on a downwards trajectory, he said. Nevertheless, populist economic measures introduced during the campaign, although helping to alleviate voters’ economic concerns are likely to cause economic difficulties in the future, said the article on the CSIS website on Monday. The challenges ahead were highlighted on Monday, the day after the election. Turkey’s currency, after initially gaining sharply against the U.S. dollar, fell back to its starting point by the day’s end. Turkey’s stock market followed a similar pattern, closing down more than 2 percent from its Monday high. 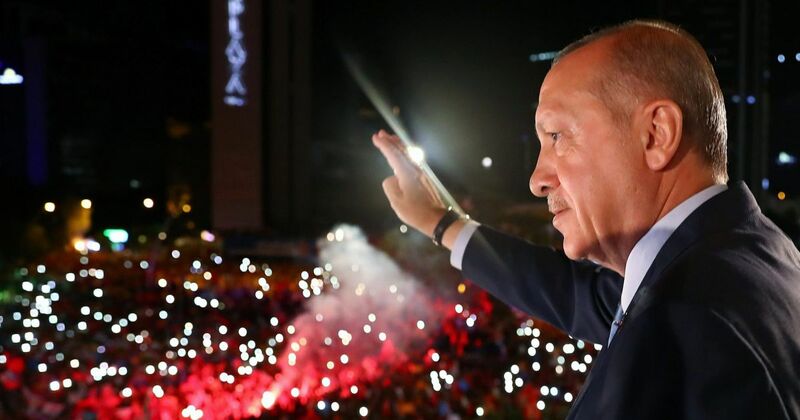 In Turkey’s first simultaneous presidential and parliamentary elections on June 24, Recep Tayyip Erdogan demonstrated yet again that he still has the magic formula for winning elections. Despite a comparatively lackluster performance by his Justice and Development Party’s (AKP) high standards in the two-month election campaign, suggesting ‘metal fatigue’, which he himself had warned about, Erdogan was reelected to the presidency with 52.5 percent of the vote, which will formally be confirmed on July 5. After having led his country for nearly 16 years, with a successful track record in elections going back even further to 1994, Erdogan thus received a fresh mandate that will keep him in the presidency until 2023 and enable him to utilize on a de jure basis the stronger powers provided by the presidential system that he designed and shepherded to implementation through the constitutional referendum in April 2017. The result justified Erdogan’s gamble for early elections fully 17 months before they were due, in order to avoid the negative electoral effects of a worsening economy while catching the opposition unprepared. Erdogan’s victory was widely expected because of the seemingly unassailable combination of his political skills, the AKP’s organizational capabilities, the immense benefits of incumbency, and the overwhelming support of official and unofficial media, as well as emergency rule (OHAL) that continued into the campaign and thus put the opposition candidates at a further disadvantage. Nonetheless, his avoidance of a second-round runoff against Muharrem Ince, the Republican People’s Party (CHP) candidate who ran a strong campaign and received a higher than expected 30 percent of the vote, confounded speculation. Erdogan’s victory was facilitated by the lower than expected votes for the other presidential candidates for the other members of the Nation Alliance, Meral Aksener of the Good Party (IP), and Temel Karamollaoglu of the Felicity Party (SP), and the stronger than anticipated support from his junior partner in the People’s Alliance, the Nationalist Action Party (MHP). Erdogan’s AKP also retained control in the Turkish Grand National Assembly (TGNA) in the less important parliamentary elections with the help of the MHP. The unexpectedly strong showing by the MHP—it received 11.2 percent, almost double what most pollsters were predicting, as it warded off a challenge for the support of its base by the IP—helped compensate for a 7 percent fall in the AKP votes from its November 2015 showing. The CHP parliamentary vote was nearly three points lower than its 2015 tally and eight points lower than Ince’s vote. This was due not only to the CHP’s chronic inability to make a breakthrough beyond its traditional base but also to tactical voting by CHP supporters for the HDP to ensure that it surpassed the 10 percent threshold. It may have also lost some voters to the IP, which finished with a disappointing 9.95 percent but nonetheless gained parliamentary representation at its first try because of its electoral alliance. The performance of the SP, which hoped to attract defectors from the AKP, was even more disheartening for its Islamist leadership. Much of the analysis before the June 24 vote had understandably focused on the economic headwinds as Erdogan’s possible “Achilles heel” in the elections. Major indices, such as the Turkish Lira (TRY) and inflation, had worsened further during the campaign and forced Erdogan, contrary to his strong, often reiterated principles, to accept three rate increases totaling 500 points, thus adding to the burden of indebtedness for his individual and corporate supporters. The election results indicate that the level of financial pain has not reached the level that might bring into doubt the loyalty of his followers. However, having averted that possible threat through populist economic measures during the campaign, which helped defeat his domestic political opponents, Erdogan now confronts formidable challengers beyond Turkey’s borders, namely the increasingly skeptical international investors whose approval and funds he needs to sustain his ambitious economic development projects. The difficulties ahead for Erdogan were clearly highlighted on the day after the election. After initially strengthening to 4.53 against the U.S. dollar the TRY weakened to around 4.70, while the Turkish stock market followed a similar track by rising to over 99,000 before falling almost 2 percent to 94,000 points. Bulent Aliriza is a senior associate and director of the Turkey Project at the Center for Strategic and International Studies (CSIS) in Washington, D.C. Zeynep Yekeler is a research assistant with the CSIS Turkey Project. Commentary is produced by the Center for Strategic and International Studies (CSIS), a private, tax-exempt institution focusing on international public policy issues. Its research is nonpartisan and nonproprietary. CSIS does not take specific policy positions. Accordingly, all views, positions, and conclusions expressed in this publication should be understood to be solely those of the author(s). © 2018 by the Center for Strategic and International Studies. All rights reserved.